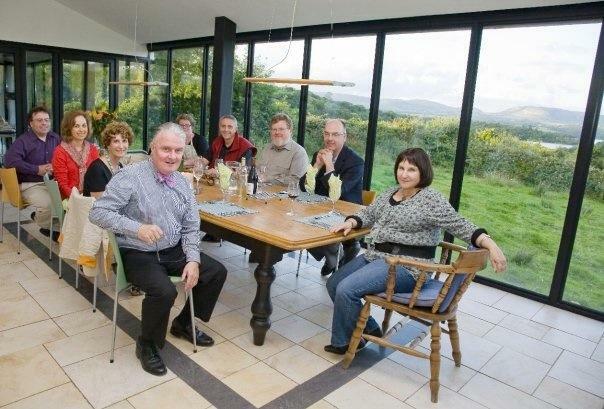 You and your guests come as a paying group for a private dinner in a private home dedicated to all that is best in Irish hospitality, food and culture. Whether on vacation, having a family celebration or simply a group of like-minded friends this will be an evening to remember. With magnificent views surrounded by Irish art and contemporary architecture, you will be served the best of Irish food by one of Irelands leading lady chefs, Paula Gilvarry but in her private home! Typically the evening begins with a series of tasty snacks as you sit near the log stove and are introduced to the location, the countryside around and then where the Yeats family and the poet William Butler Yeats fits in! Dinner, at tables of 10 is available for up to 50 persons per group (minimum 10). The menu comprises a seasonal starter, a soup or sorbet, a meat or fish dish as chosen by your host , followed by desserts, petit fours and coffee. You bring your own wines at no charge so that your personal taste can be easily and affordably met. Between courses, as you take time to digest, Damien Brennan brings you the life and poetry of William Butler Yeats. As a young boy Sligo was Yeats’ “Land of Hearts Desire” … his maternal grandparents and extended family giving the young dreamer a respite from the impoverished artistic London home of his portraitist father, John Butler Yeats. Whether you love the poetry already, have a vague remembrance of it from high school or college or indeed know nothing of it Damien promises you will leave Broc House vowing to buy a Yeats Selection on the morrow! Dinner often moves on to the “the noble call” …an Irish house custom where the host having performed his party piece then calls on others to lend a song, a poem, a dance to the evening…alchemy indeed! 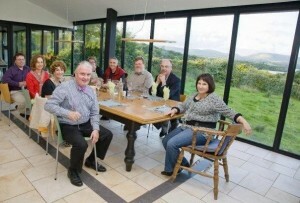 Many, many thanks to you and Paula for providing such a memorable evening for us at your home overlooking Lough Gill. Definitely one of the highlights of our tour! Whilst we all ate too much, your input was absolutely marvelous and neatly geared to our ability to assimilate the background and biography to Yeats’ poetry. 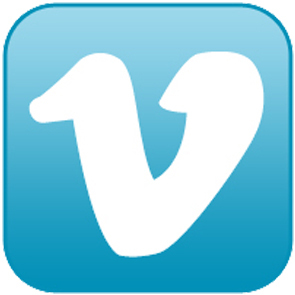 It opened vistas of understanding when we toured Yeats’ Country.